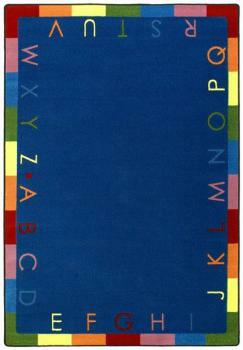 An Educational Rug full of colorful letters! One of the first lessons young preschooler learn is reciting the alphabet. We have designed the Educational Rug to engage your young students in learning the alphabet. Every colorful letter appears on both lower and upper case form, providing your students with the opportunity to phonetically sound out words. The simple and clean design does not distract students, providing you with a direct way to teach one of education's foundation lessons. Your students will move around on the Educational Rug, so you want it to withstand even the most rambunctious children. We construct this rug with SoftFlex®, which is an air-texturized, polypropylene, secondary back that is the latest advancement in area rug backing systems. Tightly woven fibers never dislodge from the carpet, thus preventing the inhalation of harmful loose fibers. The super flexible fibers eliminate wrinkles and will insulate your children from extremely hot and cold classroom floors. We combine education and safety into one durable rug.